Since 2006 16 Hands has had the honor of presenting the work of fine craftsmen from around the country in our bi annual studio tour. Many member studios host artists, introducing the community to new and different talented craftsmen each year. Check out our upcoming visiting artists and view the roster of past guests below. We have lined up an exciting group of visiting artists for Spring 2019. Having been raised in Willis, Hanna's heart sustains deep connection to Floyd, Virginia. Rural living propelled her curiosity of natural growth patterns and cycles of transformation. 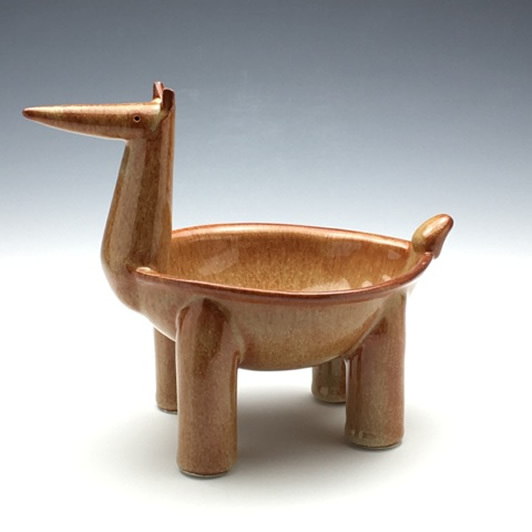 Her deep-rooted craft heritage kindles an enthrallment for traditional wood firing practices. Subtle flashes of color upon her voluptuous surfaces reveal the velocity of flame through the wood kiln, adding to the variation of each piece. Hanna's work mimics organic growth and fluid movement through her process of altering and carving wheel thrown forms. Her sculptures refer to strength and fragility of nature, imperfection and impermanence. Having lived the past 8 years in the Pacific Northwest, Hanna feels honored to show with the artists who inspired her original intrigue in clay so long ago. I am drawn to photographs, a still image in a moment in time. My goal as an artist is to make an image that connects my soul to the world I live in. In turn, my hope is that these images empower those who see them to connect their stories, their heart, to the world they see in my pictures. I want to leave room in my work for the imagination of the viewer to roam. It’s a goal. Sometimes I just make a pretty picture, or one to document my week, but sometimes I make an image that makes my spirits soar. My favorite muse is the small pond on our property, for me it gives new meaning to looking beneath the surface. I am never visiting the same place twice. My first camera was a Brownie, which I bought from my brother, for $8, or maybe it was $12, I don’t remember. I’ve used a lot of different cameras since then, from Nikon’s to Holga’s to homemade pinhole cameras. For many years I had a darkroom and was dedicated to black and white. My current camera is an iPhone. My interest in photography has led me to handmade books and paper, printmaking, alternative 19th century processes like cyanotype, paper weaving, drawing. It is a journey that is making me happy. My interest in pottery can be traced to my graduate school days in North Carolina. My wife and I often made day long trips to visit some of the traditional farm potteries surrounding Chapel Hill (Cole family, Jugtown, etc.) and started collecting. At the time, making pottery had not occurred to me but I learned to appreciate the form and craft of production. Some years later when we had moved to upstate New York, my wife wanted to set up a small studio in our home and learn how to make pottery. This eventually led to my giving it a try, taking some coursework at Syracuse University where I taught, and getting hooked. It has been full steam ahead since. We now live in an artistically rich environment (Floyd, Viginia) and I have put together a complete studio with a number of kilns that allow me to create pretty much anything that I can imagine. Living among so many quality potters has enabled me to get technical help as well as encouragement. I have been drawn to two forms of glazing that are used in most of my work: ash glazes fired in a gas reduction environment and crystalline glazes fired in a well controlled electric kiln. Both forms of glazing have presented numerous challenges, but I appreciate the beauty of both and continue to explore the possibilities of each. My goal for the coming year, five years, is the same as it has always been since I started: constant experimenting and production to increase the quality of my work. Ceramics is an activity that requires a long view in order to deal with the many mistakes that occur along the way. Although frustrating, the mistakes are part of the learning process. Wood turning is a craft using a natural material to fulfill a basic need for a bowl. Bowls contain our food and our things. Wooden bowls enliven an interior space, reminding us of our organic nature. 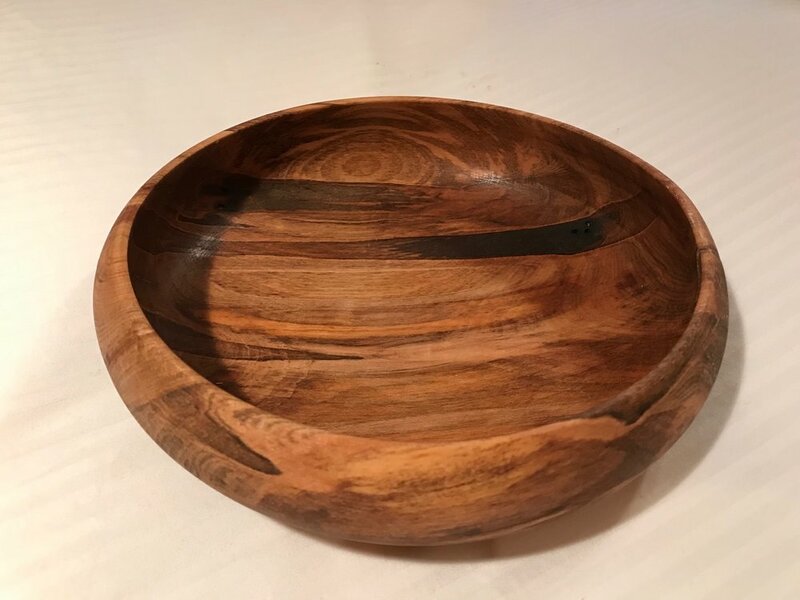 Turning bowls from native trees found on my 50 acre farm in the mountains of Virginia satisfies my desire to make useful things that are also decorative. I use trees and limbs that are fallen from storm or disease. The decoration on my bowls comes from the beauty of the wood itself I seek out wood that has been stressed by living; twisted limbs and wood infested by beetles or fungus. The tree reacts to these stresses by producing extraordinary grain and color. I sometimes fill large defects with copper or stone dust to stabilize the bowl. My bowls are meant to be handled and used, bringing some of the outdoors inside. Becky and Jon met forty-four years ago as students in ceramics at Penland School of Crafts in Penland NC. Becky had been a philosophy major who switched to pottery, and Jon had been an engineer and professor of mechanical engineering who came to Penland on a whim as a total beginner in clay. Since that time they have made a happy and fulfilling life together as potters, partners, and parents. Their commitment has been to make useful, functional stoneware pottery, intended for daily use in the home with a focus on the preparation and serving of food.. They believe that a life filled with handmade objects adds to a mindful and intentional life, while bringing a source of pleasure to its owners. Best known for their dinnerware, they also make bakeware, serving bowls and platters, along with more decorative pieces. My current work involves a combination of carving, slip inlay and slip trailing, with colored slips, underglazes, and oxide washes, sometimes including impressed texture. By using a variety of surface techniques I feel very engaged with the pot. After many years of using only impressed texture, I felt the urge to explore other methods of surface decoration. Now I often incorporate more than one technique on each piece. Slip trailing and slip inlay, while very challenging, are exciting for me because it is much like writing and drawing, two things I love to do. These techniques of applying designs by carving into, or putting on top of the surface, instead of imbedding into clay, have allowed me to explore texture in a whole new way. I am inspired by the world around me. Nature, architecture, jewelry and bead design, pattern, especially fabric designs, are constant sources for me. I grew up around fabric and it continues to inspire my work. I have chosen to make functional pots because I appreciate food, celebration, and setting a beautiful table. In this "age of communication," where most communicating is done electronically, and so much food is being eaten out of paper, plastic or Styrofoam, my hope is to have my humanity show through my pots, by bringing some creative life into eating and drinking. A handmade pot contains the soul and energy of the maker, and when used, a human connection is made. These basic connections between people keep our souls alive. My work is primarily influenced by my fascination with forms and their interior spaces, by color, and by my affinity for the sea and the allure it holds for me. I feel that we are all connected to the sea and to one another on a very primal level. I am particularly drawn to the tiny creatures found in tide pools: urchins, anemones, weird little brightly colored pod forms that seem to be somewhere between plant and animal.These pieces also appeal to my desire to draw focus to interior spaces. In nature, these forms often have dark or even dull exteriors, but on the occasion that they open up, there is a burst of unexpected color and beauty. I use traditional techniques, such as shell forming, piercing, and enameling as well as contemporary and experimental techniques like torch fired liquid enamels. This allows me to create very unique pieces that still speak to my passion for shape and form but highlight the organic nature of the liquid enamel as well. Traditionally, I have used kiln firing exclusively in my enamel work, but through adding the torch firing techniques, I am able to more precisely control the application of heat to the piece and can experiment with drawing the oxides of the copper base metal up through the enamel layer to create organic patterns and colors in a way that I have never been able to before. I find I am constantly inspired by the techniques I use and my desire to push them to new levels. Neil makes pots that are designed to be used and enjoyed. There is always an evidence of the soft material, clay, often bolstered by a formal or architectural structure. He knows that to have an intimate connection to the hand formed object is vital to a full life. To experience the touch of a potters hand while savoring a cup of coffee or a bowl of soup is one of life's sublime pleasures. For award-winning jewelry designer Agnes Seebass combining her contemporary cutting-edge design with ancient Mexican motifs was a natural progression. The clean lines and geometric shapes of her jewelry are a direct result of her German background as well as the influence of Mexican art from years of living and studying there. Agnes' sophisticated silver jewelry is perfect for the office or evening wear. She incorporates the philosophy that "less is more" in all aspects of her art, business and life. The joy of using pots every day goes hand in hand with loving to make useful pots for others to embrace in their daily lives. My current work focuses primarily on wheel-throwing using porcelain clay, and occasionally using stoneware clay, to make useful wares such as drinking vessels, bowls, plates and an assortment of pots that can be used in the kitchen for food preparation. The feel and the smell of the clay, the beauty of the wet pots, the variety of glaze results, and the making of new forms are all a part of why pottery-making is a compelling life pursuit for me. Knowing that others enjoy using those pots makes it all even better. 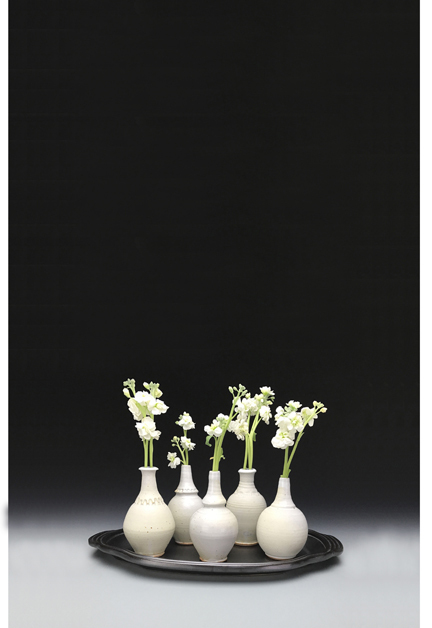 The porcelain glazing this year explores a bright white glaze, also modified to make pale blue and pale green versions, having a soft, satin-feeling surface that is contrasted by the use of colored clear glazes on the same piece. The stoneware pots are glazed with our studio glazes that my husband, Will Swanson, uses for his pots: shino, carbon trap, white shino, my old 7-White from my early years, and occasionally a black/temmoku. The white that I use on the porcelain, and its soft blue and green variations, are also being applied to the stoneware with very interesting and pleasantly touchable results. Everything is high-fired in a gas reduction-atmosphere kiln. Benjie appreciates joinery, color and detail in his furniture. Dovetails, mortise and tenons and lock miters act both as strong joints and carefully considered features. Benjie seeks out those unique pieces of wood that nature has dyed in unexpected ways. He carefully selects bright red Paduk, high contrast light yellow and rich black and purple poplar, red orange cherry and ‪deep purple‬ walnut. Rest assured that each bevel, each proportion, each angle, and each material has been overthought and he has enjoyed every step of the process, except the pricing. I began my explorations in clay almost 14 years ago. I was seduced by the material and the wheel, and the idea that I could create something beautiful and useful at the same time. My interest then fell into surface and color, using textural porcelain slips and layered glazes to create bright, flowing, and volatile surfaces. As I have grown and matured in life, my work has followed. I am still fascinated by glaze and surface, but with a higher understanding of form and flow. I am deeply influenced by classical shapes and why and how they were made. I attempt to embrace these studied forms but with a contemporary twist. In my current method of firing in a large two chamber wood kiln I am exploring the interaction between form and fire; building a relationship in the piece between the function, surface, and the story of the firing process. Each pot is made and placed in the kiln conscientiously with an expectation and openness. A desire for success, and a pupil’s acceptance of result. I make my pots out of a proto-porcelain that is mostly wheel thrown, sometimes cast, and fired in a gas reduction kiln. There are elements of hand-building, extruding, and mold forming incorporated throughout the body of the work. In general I am more attached to the idea or form of a potential piece; this has led me to using many different methods of making. Inspiration for the work is as varied as life. It comes in many forms and at times completely random. I have a deep routed interest in historical Asian ceramics, namely 12th & 13th century Chinese pottery. I continually find new avenues and elements of working from that era to incorporate into my pieces. Aside from the formal aspects of those historical works, I also find the concept of place based making and the use of local materials both captivating as well as challenging. I feel that a better understanding and appreciation of my materials will in the end help to produce a better piece. For me, pottery is a blending of both function and aesthetic. While I am very attuned to form, color, and design, drawing much inspiration from nature, I also pay attention to the way my work feels to hold and how easy it is to use. I want the handles of my mugs and pitchers to have a comfortable grip, for example, and I curve up the edges of my plates slightly so sauces don't run off and peas don't escape. My pots each display evidence of the process I use to create them. In our society dominated by mass production and faceless corporations, handmade objects introduce human connections that I think we all yearn for. I want to draw the user in to look at the differences in subtle details of my work: the way the lines travel around the pot, the point at which they waver or are sharp and crisp or how the glaze breaks over a curve. I hope that the daily use of my ceramics will remind the user of the slower, handmade, and local aspect that they can choose for their lives. Daily I create with my hands, exploring, experimenting, moving the clay, making a living. In the studio I enjoy the repetition as much as the exploration of new forms and surface designs. I am full of gratitude that creativity continues to move in me daily. Making and using pots to me is learning to see, learning to pause, to share, to see beauty. My work is exploring the surface balance of a natural patina and vivid color. The natural patina is clay showing its rawness and its depth. The bright surface colors are influenced by my living and traveling in Latin America and the colorful textiles, fabrics, people, and birds that I have come to know and love. The surface designs are influenced by my daughter’s drawings and the naturalness of children’s art. I teach and work with children weekly because they uplift me and bring me hope. There is something whimsical and pure in children’s perspective and creativity that continues to inspire me. I make pots in a small studio on the French Broad River in Asheville. My pots speak to the historical nature of function and beauty found evident in many cultures. The forms I make are deeply influenced by tradition but with a contemporary twist on surface and texture. Each pot is hand made with high fire North Carolina stoneware clays, porcelain slips, and over seventeen different glazes. My pots are fired in my two chamber wood kiln at my home in Madison County, with wasted wood from various local sources. Pots in the front chamber are naturally coated with wood ash and flame during the firing for unique flashing and individual surface. The second chamber is filled with glaze ware and heated to cone ten in a reduced atmosphere by the escaping heat and flame from the front chamber. My entire firing last for two full days. My work focuses on image, pattern and decoration in order to reference ornamentation and historical jewelry. As a maker, it is my intention to challenge the conventions of handmade jewelry through the use of inexpensive materials and new approaches to design and surface decoration. By combining the handmade with the industrial and the digital, I aim to produce pieces that speak to the past, present and future of Craft while maintaining familiar identity between the viewer/wearer and the object. I make hand-built earthenware vessels that draw on the quiet, minimal forms of basic function, such as basins, troughs and baskets. Surfaces emphasize the subtleties of material, process and firing as the primary decorative elements – dragged grog, finger marks, the layering of slips and terra sigillata, and the dulled whites and blacks that come from reduction firing at a low temperature. Smaller pieces like plates, cups, mugs and bowls are wheel-thrown, then scraped and pared down in form and reduction fired. Most recently I have been pulling from my long love of textiles to add pattern and color to this smaller work. Making pottery is a lifestyle choice as much as it is a career choice…it is an integrated way of living, where work and play and everyday life all dissolve into each other and that suits me. It also allows for a great deal of variety: not only do I make pots, but I teach workshops, exhibit, write a blog and promote a show. My own pleasure in making pots is made all the better by the pleasure that they bring to others. The opportunity to meet and talk with my customers brings me great satisfaction. I enjoy the aesthetic challenges of making pots as well as the physical labor that being a potter and firing with wood entails. It is important to me that my work be finely crafted and made to a very high standard. I love the architectural qualities of clay, the permanence of stoneware, and the sweet magic that occurs when good pots, good food and good people come together! The intricacy and resilience of nature, is the core inspiration for my work. For more than a decade, I have experimented with printmaking, and most recently focused on eco-printing, relief processes, and local plant-based dyes to render works that both document and celebrate my immediate surroundings. The resulting impressions are incorporated into art quilts, textile collages, artist books, and other objects. I strive to capture the sense of awe and contentment experienced when we take the time to observe minute elements in our path, be it an unfurling fern frond, a broken butterfly wing, or a translucent seedpod. By paying attention to the beauty around us we will find it easier to appreciate—and want to protect—the environment as a whole. Tom is a current Resident Artist at the Penland School of Craft in Penland, NC, and shows his work throughout the US. His functional forms are thoughtful and unique, with a particular ability to find a special place in any home.